If you are a self-hosted WordPress user, then you would know the fact that all your site data is stored on the servers. When you buy web hosting, you buy servers and disk spaces to host your blog contents and data. While buying web hosting and comparing multiple web host providers, you may have noticed a term called uptime. Most of the hosting providers claim up to 99.99% uptime that means no matter what, your site wouldn’t face server downtime issue. But, that’s not the case, and despite being hosted by a reputed web hosting provider, you may face website server downtime issues. In this article, I will be discussing server downtime, reasons behind it, how it affects your site and how you can keep track of it. So, let’s get started with the first in line, what is Server Downtime. Servers are nothing but computers that are setup to work 24×7 and keep transferring data. Due to some technical issues, these computers (or servers) may get shut down or stop transferring data for some amount of time. During this period, your site and its data will not be accessible by visitors since there’s no sharing of data happening at that moment. Thus the amount of time for which your website goes inaccessible is called Server Downtime or Website Downtime. In simple terms, when your site can’t be opened or stopped displaying web pages, it is facing the server downtime issue. Out of many technical reasons, three important reasons which cause Server downtime are listed below. PHP (Hypertext Pre-Processing) is the default language used by WordPress behind its structure. When you install more scripts, plugins, and services that your server can handle, then there are high chances that your site will go offline. Every script, plugin, and service your site use, require PHP Memory to run. There’s a default size limit for this PHP memory, and it differs from host to host. When these services start using this memory more than its allocated capacity, then the server may crash and result in downtime. However, there’s a way out to it. You can manually increase your PHP Memory Limit for individual hosts. Follow this article by WPMUDEV for more information. **Requires Technical Knowledge. The next reason behind downtime can be the not so properly optimization of your blog. Again, this may be because of installing more than requiring plugins and scripts. To avoid it, lower the number of installed plugins & scripts and install only those who are important. The last and the most prominent victim of Server Downtime is Poor Web Hosting. You should never buy web hosting from untrusted hosting providers, just because they are cheap. What these providers do is to host some sites on the same server which can’t handle the promised traffic and thus result in the offline state. Shared hosting providers like BlueHost and SiteGround are the best choices to buy web hosting when you are starting your blog. If you aren’t hosted with them, then consider doing it now. The Good thing is that both Bluehost and SiteGround provide free migration services. It makes migration from one host to another hassle-free. However, once you hit the 25k-50k monthly traffic mark, you should consider moving to managed WordPress hosting. So, you saved money by not spending on trusted web hosting provider? Here’s where you pay more than what you have saved. Server downtime can cause some serious damage to your blog and business. Here are few of them. When a new visitor visits your site for the very first time and found it to be down, will he ever care to revisit to the site? Heck, No. Initial impression plays a significant role, and it can make or break your site. The new visitor which you lost due to server downtime could have been turned into a paying client or customer. Alas, you missed the opportunity. The above situation is not limited to new visitors, and same applies to your regular visitors who may visit your site on a daily basis. When your site is facing downtimes many times a day, the visitors get irritated and assume the website to be dead. It may cause them to delete your site from their bookmark and never look back. As discussed earlier, loss of new and regular visitors may lead to loss of Clients and ultimately Money. Moreover, if you are a blogger who is offering blog optimization service, then people would find it hard to believe in your work and may not buy your service. And the last big thing you can lose due to server downtime is Search Engine Rankings. Yes, your hard work and all the SEO strategies you’ve used to rank on the SERPs will go under vein. When your site remains in the offline state for more time, web crawlers wouldn’t be able to crawl it for latest changes. It will make them believe that your site is not working properly and Google will start removing your site from search engines pages. Now the biggest question arises here is that how to keep track of downtime. I mean, if you are unaware of the downtime then how will you solve it? There are various Plugins and Online Tools that offer downtime monitoring and will notify you every time there’s a downtime. The working behind Server Downtime Monitoring is simple. These plugins or tools will ping your site regularly to check the working state. Whenever they encounter a downtime, they will notify you that your site is down via email or SMS. Most of these plugins & services ping your site in every 15 minutes. Below are some of the recommended Plugins and Services I have used to monitor server downtime of my blogs. 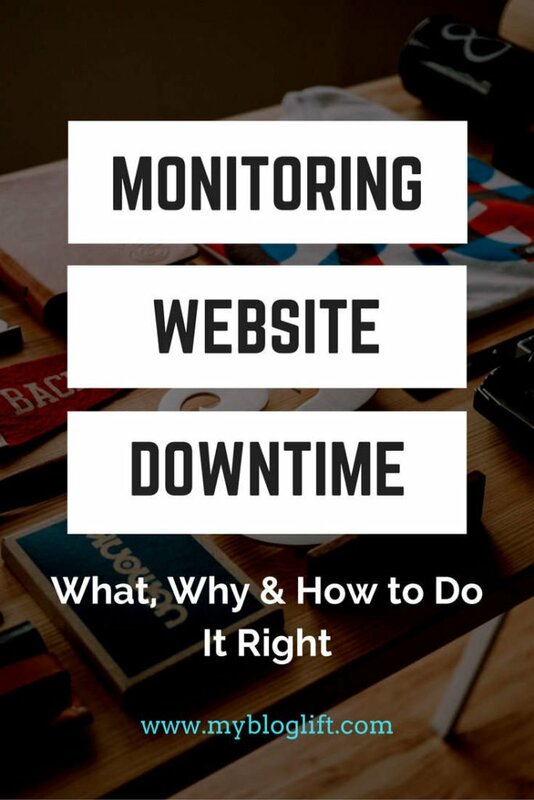 Monitoring Downtime is crucial for every blog and online business owner. If avoided, it can lead to some serious issues for your business. Losing money and potential clients is undesirable for everyone, and that’s what makes it valuable. I believe that this guide about server downtime would have helped you understand and avoid it better. What’s your take on server downtime? What are the tools you are using to track and prevent it? Let’s discuss in the comments section below. Don’t forget to share this post with every blogger and online business owner you know. Sharing is caring. And feel free to pin below image to your favorite Pinterest Group Board. I liked your article. I did not know that this was important to do. Thank you for posting this. what are the amazing wording you select to describe the server downtime. You describe it very briefly. all the reason server downtime you discuss.then you discuss their effect and then their treat how we avoid form them. Thanks for taking time to comment. Glad you liked my article. Shorter Blog Posts: Smart Move or a Huge Content Marketing Mistake?